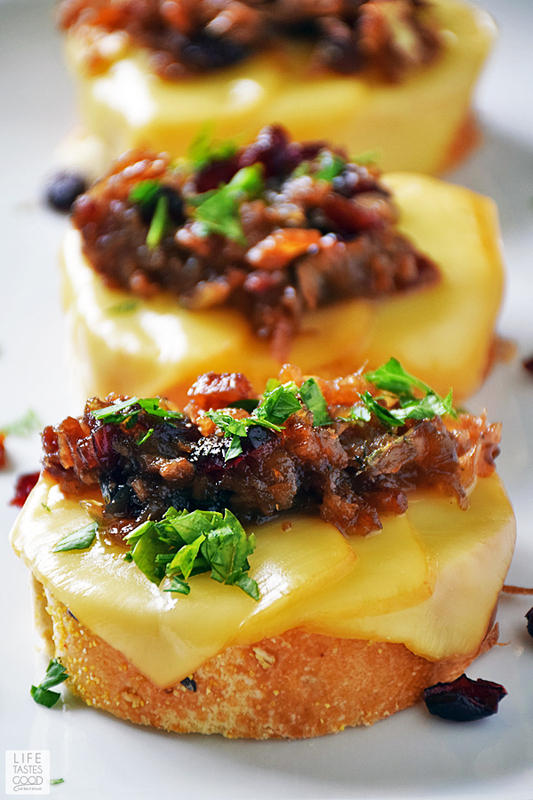 Cranberry Bacon Jam Crostini is the perfect party appetizer! Bite sized deliciousness that's quick and easy to make will be the hit of your parties year after year! Christmas is exactly next week!! Are you ready? We've never been big on exchanging gifts for the holiday. Instead we celebrate the season enjoying family and friends with delicious food and good times, which is why I LOVE the #SundaySupper theme this week. If you are gathering with friends and family to make holiday memories you came to the right place! The tastemakers are sharing our favorite Easy Holiday Party Recipes. 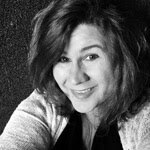 Thanks goes out to Caroline of Caroline's Cooking for making this event possible! If you're looking for ways to use up that eggnog you have in the fridge, check out my Baked Eggnog Donut recipe. You'll also find all of the Tastemaker eggnog recipes there too! Don't forget the cookies! The easiest cookies you need to make this season are my Black Forest Cookies. Only minutes to put together, but super impressive! For a last minute gift idea check out my Peppermint Bark Candy. It's easy to make, pretty, and always a hit! 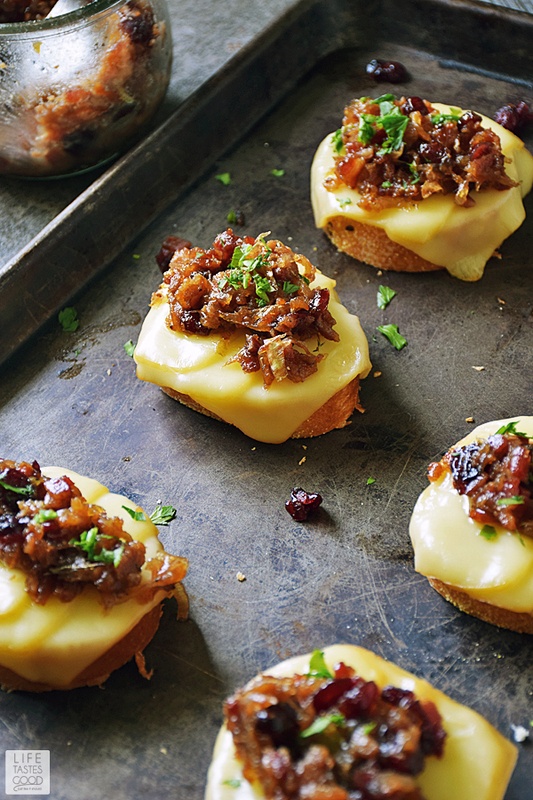 My Cranberry Bacon Jam Crostini is the perfect party appetizer. It is so easy to make! 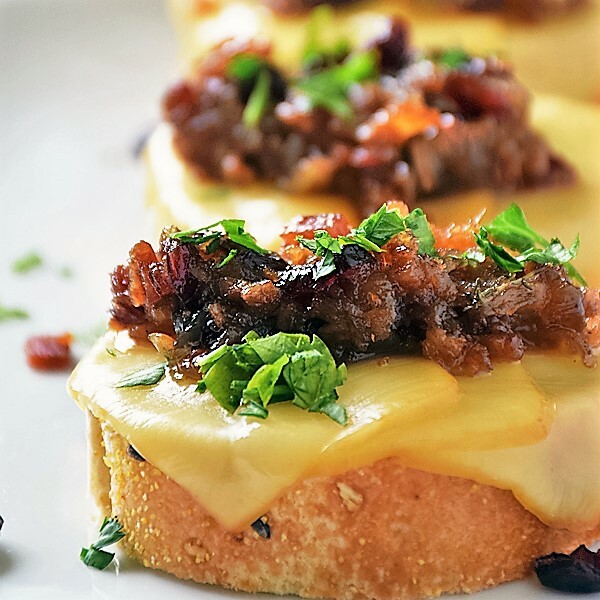 The Cranberry Bacon Jam can be made up ahead of time and then you just have to assemble the crostini and pop them under the broiler to melt the cheese. The flavor is a real crowd pleaser! Bacon Jam is amazing, but add the sweet tanginess of cranberries to the mix and you get a whole new level of deliciousness! Sweet, salty, and a little bit tangy alongside the smokiness of the Gruyere cheese makes for a very satisfying bite. This party appetizer is sure to impress! Be ready for these babies to disappear quickly! To make this recipe, first make up the bacon jam. It's pretty easy to do and you can view step-by-step photos on my original Bacon Jam Recipe. Just be sure to follow the directions listed below if you want the added goodness of cranberries. The ingredients do differ slightly. When ready to assemble the crostini, cut a baguette into 2 inch slices and line them up on a sheet pan. Top each piece of bread with Hickory Smoked Gruyere cheese. Top the cheese with about a tablespoon or so of Cranberry Bacon Jam. More or less to your liking. See my recipe prep tips, below, for more helpful information about this recipe. Turn the oven to high broil and place the sheet pan on the middle oven rack. Broil for about a minute until the cheese melts and bacon jam is heated through. Remember to keep the oven door ajar when broiling and watch it closely so it doesn't burn. Make the Cranberry Bacon Jam up ahead of time and store in an airtight container in the fridge. Just be sure to hide it or else it's likely to disappear. Purchase a smaller baguette. One that isn't so big around so this appetizer doesn't end up being a full blown meal <wink>. Gift idea: Put the Cranberry Bacon Jam into small glass jars to give as gifts. Everyone will be very thankful for their little jar of deliciousness! Giving the gift of bacon jam is sure to spread holiday joy! Add the chopped bacon and stir 1/2 cup cranberry juice and 1/2 cup dried cranberries into bacon mixture. Cook until the overall color is a dark brown and has a jam consistency, about 15 minutes. Give the Bacon Jam a taste and adjust the seasonings to your liking. Allow the bacon jam to cool slightly and transfer to a serving dish. Store bacon jam in an airtight container in the refrigerator until ready to use. When ready to prepare the crostini, preheat the oven to high broil and slice the baguette into 2" thick slices. Place the bread pieces onto a sheet pan and top with Gruyere cheese. 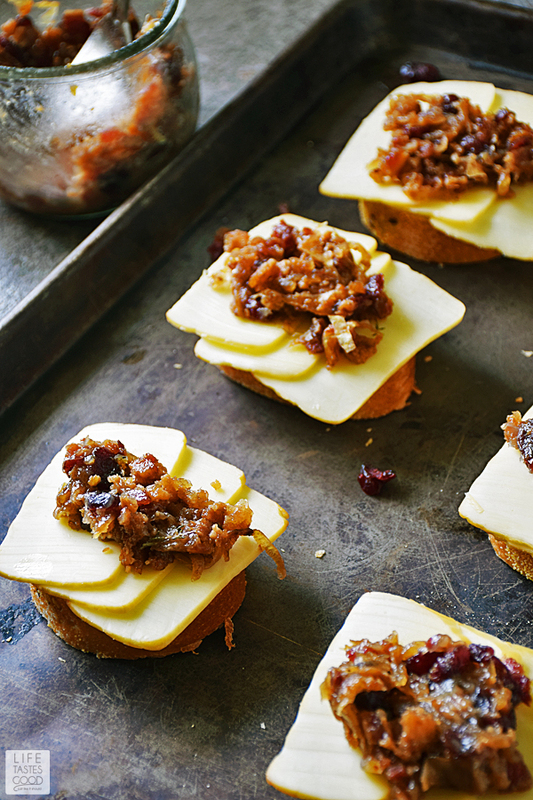 Top the cheese with about a tablespoon of Cranberry Bacon Jam. Place the sheet pan in the oven on the middle oven rack. Broil until the cheese melts and the bacon jam is heated through. This will only take about a minute. Remember when broiling, leave the oven door ajar and watch carefully so it doesn't burn. Remove from the oven when the cheese is melted to your liking and sprinkle with freshly chopped parsley for garnish. Serve and enjoy! 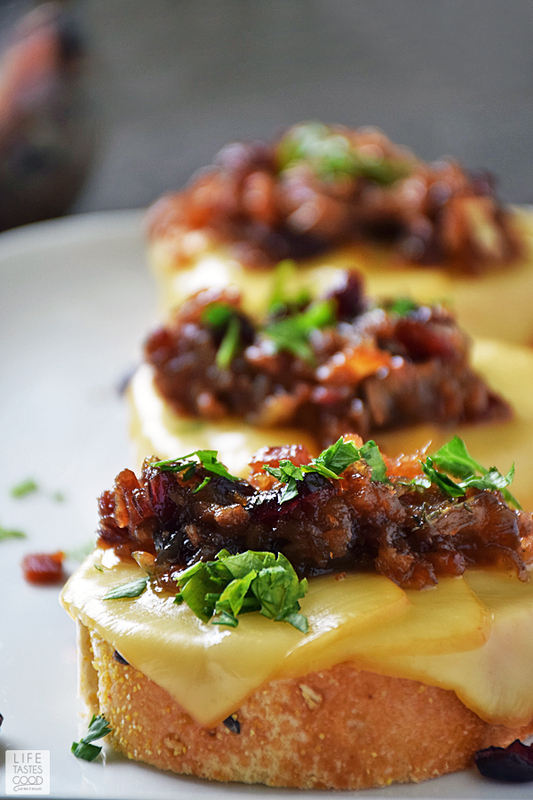 Cranberry Bacon Jam sounds insanely delicious! Your photos are amazing! I love the sound of this jam. I can think of so many uses for it!